This was my first Bill Crider book (shame on me) and the first in the Sheriff Dan Rhodes series begun in 1986. Based on this one book, I'll definitely be reading more. It's exciting to discover a new series (new to me) that's quite a few books along since it gives me lots to look forward to. 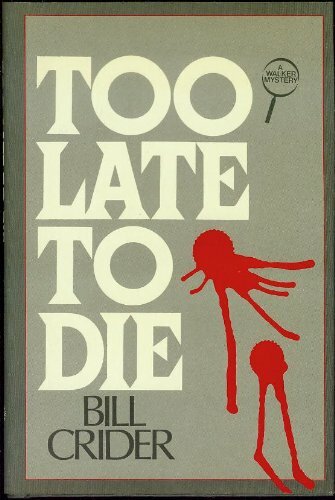 Bill has written several other series also worth investigating as well many short stories and stand alone novels, so it's a win-win situation all around. Dan Rhodes is a resilient and likable small town Texas sheriff with a taste for Dr. Pepper and baloney sandwiches. He is a widower living with a grown daughter and running for re-election faced with a formidable opponent who is not only taller, but a better dresser and more charismatic when it comes to speech making and glad handing. But Rhodes only knows to be himself and that will have to be good enough for the people of Blacklin County, Texas. "Ralph Claymore was Rhode's opponent in the May election, less than a month away. He was ten years younger and, Rhodes was convinced, much better-looking than the present sheriff. He had wavy black hair with no gray in it, and he could wear tight-fitting western shirts without revealing the slightest bulge in the area of his belly. He wore western hats like he was born in them, and boots, and big silver belt buckles. Rhodes didn't like boots because they hurt his toes. He didn't have any silver buckles, and he knew that in a western hat he looked like a cat turd under a collard leaf. And now he had a murder on his hands. He might not look like a sheriff, but he was damn sure going to have to act like one." There is a kind of elegance of nature to Dan Rhodes which comes across as the book develops and we learn more about his day to day and the problems facing a sheriff with few resources, little staff and no modern gimmickry. A night that begins with a petty grocery store robbery suddenly changes direction and the sheriff finds himself embroiled in the first of three murders and eventually a death by wild boar. Not at all the sort of thing which makes for a quiet election cycle especially when the sheriff himself gets roughed up once or twice. AND as if that weren't enough, the deputy who is dating his daughter is accused of beating up two guys outside a club. And those two guys have hired a lawyer to sue the town and the department for police brutality And on a personal note, the sheriff is being pursued by a persistent widow who thinks the mourning period of a year is quite long enough. Though in the meantime at a political rally, he has met a nice woman named Ivy running for Justice of the Peace. At first I thought I wasn't going to engage with the story in the way I like, but that quickly changed and I read the book in two nights as Rhodes and the cast of quirky characters grew on me. Not to mention that I'm fond of plots with several dead bodies. Bill Crider manages one of the more difficult tasks when writing mysteries: combining so-called cozy elements with the visible brutality of murder - one of which takes place in front of our eyes as the sheriff is questioning a suspect. Besides murder and coziness, Bill Crider also injects plenty of action into the plot - action which, at one point, brings us face to face with a bunch of surly wild boars. Everything works together pretty seamlessly and makes for a satisfying story with an ending you won't see coming - perhaps because of the giant red herring used deftly by the author. There is also, partway though the book, an outrageous scene at a funeral which is so unexpected and so hilarious that I burst out laughing - in fact, laughed so hard that I worried my neighbor might hear and think I was up to no good. Though there are several amusing incidents in the book and one or two good laughs, I had not expected this wild rumpus at the funeral of one of the victims. If nothing else, this along makes the book memorable for me - I love a good laugh. I won't say any more about it because I don't want to spoil it. 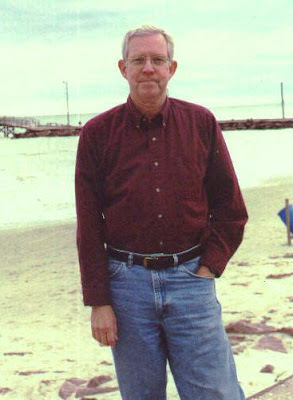 Today is a special day over at author Patricia Abbott's blog, Pattinase, a celebration of Bill Crider, author and extraordinarily nice human being. Bill is having some health issues now and we want to make sure he knows how much he is admired and well thought of even by those of us who had never made Dan Rhodes' acquaintance until recently, but who had heard over the years how much the author was liked, admired and respected on a personal level. When an author is known to be a good guy, it always adds a bit of something extra to the author/reader relationship - at least for me it does. Check out his Fantastic Fiction page to get a full listing of all of Bill Crider's books. There are more than I ever imagined. As well as being a wonderful writer, Bill Crider is prolific - good for us. And that's a very good thing. :) Actually I was surprised by just how much I enjoyed this book - not quite what I expected. I love a good surprise. Mudpuddle: Prather passed away in 2007. A posthumous novel was published in 2011. Just about all of his books are currently available as e-books. Nice piece, Yvette. You have a lot more Dan Rhodes novels (23 at the moment) waiting for you, and another due out next year. Thanks, Evan. I'm really looking forward to reading more. I'm also going to try some of his other creations. Great review, Yvette. This is not my favorite Dan Rhodes mystery (I have now read 5 of them) but I do think it is the best place to start. My favorite is the 2nd one -- SHOTGUN SATURDAY NIGHT -- but I do enjoy them all. I love his references to Dr. Pepper, since that has always been my favorite (and my son's) and in the book I just read he makes pimiento cheese sandwiches, which I also love. Thanks, Tracy. I tried pimiento cheese sandwiches twice - one I made myself from scratch which was excellent. And one from the deli section of the super market. On the whole I think mine was best. But either/or I enjoyed it. Not anything I had ever tried before. Same goes for the books. In this book, I LOVED the funeral scene, I just laughed so hard - love when that happens. Shame on me too, Yvette,because like you I hadn't read anything by Bill prior to the one I read for this special Friday. And it was just so good that I want to read more of him. This book sounds promising too. Unfortunately, right now I don't intend starting any series so will put this on hold. Thanks for the review. You're very welcome, Neeru. I don't know why we had never read any Bill Crider books before, but it's good that we're going to make up for lost time.